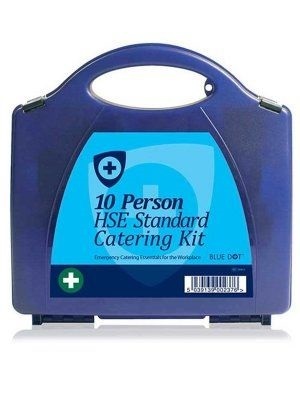 HSE 10 Person Catering First Aid Kit in Integral Aura/Eclipse Style box with superior contemporary looks. Durable polypropylene box with safety clips, integrated carry handle, and a secure lid provides protection from dust and water. The Catering kits are ideal for any catering business or general food preparation area. All contents meet the Health & Safety Executive guidelines.